I began my gardening efforts on Friday by selecting 17 of my favorite results from last year's Beefy Resilient Grex bean trial and planting them out in my perennial bed alongside the grapes and asparagus. I put them there because that's the best soil in the yard right now, and since the beans in this trial are scarce and irreplaceable, I wanted them to have the best possible growing conditions. Any of those 17 could one day become a new variety, which is quite a thrilling notion. The problem I ran into at that point was that the rest of my garden beds are still occupied by my spring crops, which have about a month more to go before they can be harvested, so I didn't have any more space for planting the remainder of my beans. I ended up spending all day Saturday weeding various patches in my back yard to plant an additional 25 square feet of beans. These are either varieties that seem promising in themselves or as potential parents in a breeding program. I've drawn up a list of crosses among them that I want to try this year in an effort to improve either flavor, maturity, or yield. I did make one manual cross last year that resulted in 2-3 seeds that appear viable. I planted those in a pot to keep them isolated and, hopefully, protected from pests. I've got my fingers crossed that I'll obtain at least one good plant from that. I spent the rest of the day continuing to plug away at the art for the game I'm designing. 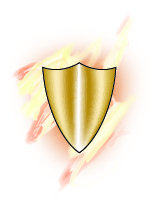 In particular, I worked on the designs of the magic items, like this shield. Illustrator is great at making sharp outlines, but when it comes to doing gradual color transitions (like the shades of gold on the shield), it's a HUGE pain. You can't just paint with brushes as you can in Photoshop; the Illustrator brushes all have hard edges with no feathering or blurring. The shape has to be converted into something called a "gradient mesh," which consists of tons of little dots that have to be manipulated individually. With enough time and attention, it can produce astounding results (as I've seen in some of the reference books I've been using), but it's not a very intuitive way to draw. I'm really hoping I will improve with continued practice. This is so exciting! We may have to consider making more raised beds for your garden. I hope this year's efforts yield some good results. Bob says he could put some along the fence on the side where the compost bin is or on the patio where the container plants are. I don't know where the plants would get the best sunlight, though.